NOTE: Requires 152 Test Points for Low Voltage Testers and 256 for High Voltage Tester; will not work with Model M2U-basic! Eight identical RJ45 modular sockets are provided. Use one at a time, or up to eight simultaneously. Mix one of these boards with any other CB board on the other side to test octopus and other multi-headed cables. 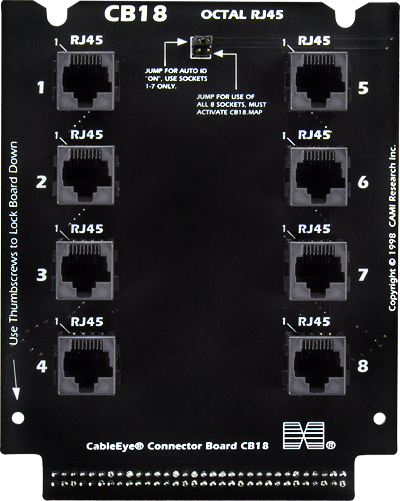 Graphic image for two or more connectors shows a group of eight RJ45 images. Set of two boards.